I think it’s fair to say that the Boneyard is a dank and miserable place; sad and lonely even. Few linger longer than they need to; those that do receive scant reward for their efforts. The sporadic, inane ramblings of a senseless loon are all that greet visitors here. But light can be found in even the darkest of places; blogger extraordinaire and all round Aussie gent BT has found that chink of light and graced it with a rather fetching One Lovely Blog award. Cheers, BT. Here it is, in all its pink and luscious loveliness. Brightens the old place up a little, don’t you think? Wonder if it will have a similar effect on my writing? 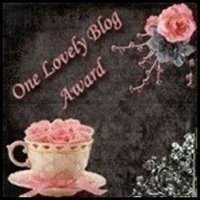 Of course, awards must be passed on and I can think of no-one more deserving of the One Lovely Blog award than the very lovely Rebecca Nazar. And I think your choice of who to pass it to is inspired as well. Oh, God, please shoot me now! You know, I think the pink cup is starting to look a little big creepy. BT – Sorry, but I only have one bullet and that’s for me. Rebecca – Absolute pleasure. Don’t think pink is my colour to be honest. Cate – Everything that comes here starts to look creepy eventually.